Since modern polling began, no president has been as unpopular at this point in his first term as Donald Trump is today. So should Republicans worry that Trump will hurt their prospects of keeping control of the House in the 2018 midterm elections? In a word, “yes” — if Trump remains as unpopular on Election Day 2018 as he is now. It might seem like Republican congressional candidates should be able to escape Trump’s unpopularity. Trump, after all, was the least liked major-party presidential candidate on record. Yet Republicans in 2016 won the national House vote by a percentage point and took 241 out of the chamber’s 435 seats for a net loss of only six seats. And even though Trump is historically unpopular as a president, he was even more unpopular as a candidate: Trump’s current disapproval rating in the FiveThirtyEight aggregate is 56 percent, while 2016 general election exit polls put his unfavorable rating at 60 percent. No wonder some Republican House members might be reluctant to distance themselves from Trump, no matter how unpopular he might appear in polls. That logic, however, misses a key distinction: Midterm elections are different from those that take place in presidential election years. And midterm elections that take place with an unpopular president in office are very different from presidential election years that have two historically unpopular candidates at the top of the major-party tickets. Republican congressional candidates in 2016 may not have gotten much help from Trump, but they got a big boost from someone else: Hillary Clinton. Clinton, it’s easy to forget, was only modestly more popular than Trump. According to Gallup, Clinton had the second-worst unfavorable rating of any major-party presidential candidate in modern history, behind only Trump. In the 2016 exit polls, 55 percent of voters had an unfavorable view of Clinton. Next year, though, Clinton won’t be on the ballot (although Trump continues to tweet about her). That could be a big problem for House Republican candidates, especially if Trump remains unpopular. That’s because realistically, the only way for Democrats to take back the House is to run up huge margins among voters who don’t like Trump. Two surveys conducted this spring by SurveyMonkey for FiveThirtyEight suggest that Democrats may get the margin they need among Trump disapprovers to take back the House. In these polls, SurveyMonkey asked voters (among other questions) whether they approved of the job Trump was doing as president and whether they planned to vote for the Democratic or Republican candidate for Congress in their district in 2018. On average, the surveys found that Democratic House candidates would win 82 percent to 7 percent (a 75-point margin) among respondents who disapproved of the job that Trump was doing. (The two surveys found very similar results.) Meanwhile, House Republican candidates won by an average of 78 points among respondents who approved of the job Trump was doing. That’s slightly worse than Republicans did among those who had a favorable view of Trump in 2016, according to the exit polls. Overall, the SurveyMonkey polls gave Democrats a 9-point lead on the congressional ballot. That’s very close to their average 10-point edge in the FiveThirtyEight congressional ballot tracker. It’s also much better than the 1-point margin Democrats lost the House by in 2016 and the 1-point lead they had in the final national congressional ballot polls before the election. And although we can’t be sure of how exactly the vote share margin will translate to a seat margin in 2018, a 9- or 10-point win for the Democrats in the national House vote would put Democrats in a good position to take back the House. The Democrats’ momentum shouldn’t come as a big surprise. Midterms are usually more about a referendum on the president than a choice between the two parties. Since exit polls first started asking voters about their opinion of the president in 1982, those who disapprove of the president’s job performance going into a midterm election have overwhelmingly voted for the party that is not in control of the White House. Excludes those who voted for third-party candidates in the midterm elections from 1982 to 2006. On average, the party out of the White House has won by 67 percentage points among those who disapprove of the president’s job performance. In the past five midterm elections, the opposition party has won that group by an average of 71 points. That’s close to the margin that the average SurveyMonkey poll has the Democrats winning by among those who disapprove of the job that Trump is doing. In other words, the SurveyMonkey poll suggests a 2018 midterm election that is in line with history. Of course, Trump has well over a year to increase his approval rating before Election Day. And it’s not as though the Democrats are exactly popular: A May Gallup poll, for example, shows the Democratic Party with just a 40 percent favorable rating and a 53 percent unfavorable rating, both of which are on par with the president’s and the Republican Party’s ratings. Then again, the Republican Party’s low favorability ratings didn’t help the Democrats hold the House in 2010 or win it back in 2014, both years when Republicans were about as unpopular as then-President Barack Obama and the Democratic Party. Republicans still might not choose to distance themselves from Trump. The 2016 election taught us that the lessons of history don’t always apply to modern politics. 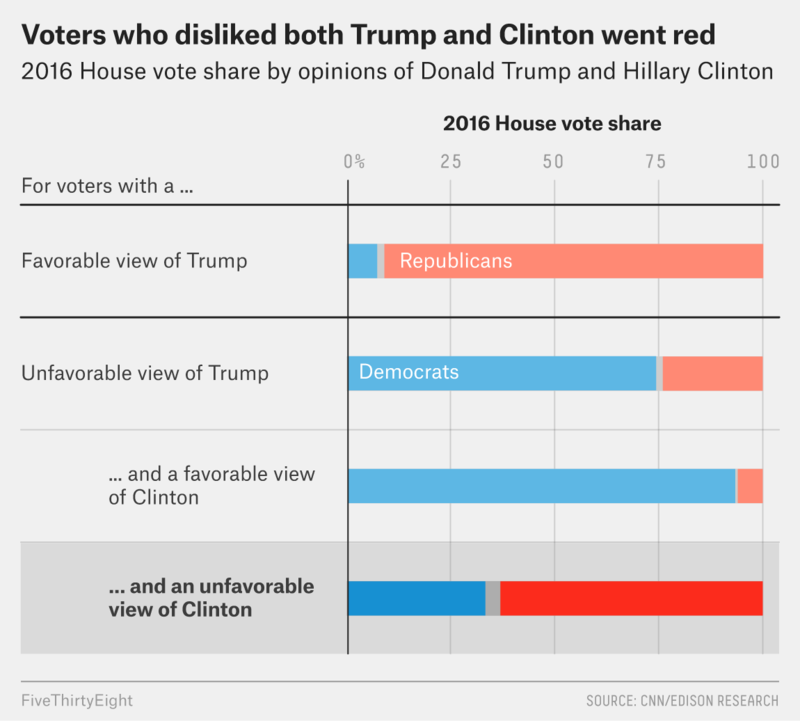 Maybe the Democratic Party’s unpopularity will be a difference-maker in 2018 like Clinton’s unpopularity was in 2016. Maybe Democrats won’t turn out to vote in 2018. Still, these are risky bets to place with a House majority on the line. Trump is more likely to be a liability than an asset in the 2018 general election. Presidents tend to get more unpopular in the lead-up to midterms, and people who don’t like the president tend to vote against the president’s party. This assumes that Democrats must win the national House vote by 5 to 8 points to take control of the chamber and that Republican candidates retain their big margins among voters who do like Trump. This 70- or 75-point margin should ensure that Democrats win the House popular vote by a margin wide enough to overcome that Republicans have had a tendency recently to win a larger percentage of seats than their vote share would indicate.